We’d love your help. Let us know what’s wrong with this preview of Stronger for Language by Perry Elisabeth Kirkpatrick. Kenzie discovers she has unique skills from hours spent translating what her twin 3-year-olds are saying. She just might save the day when her husband, the starship's captain, gets into a linguistic pickle with a new alien race! 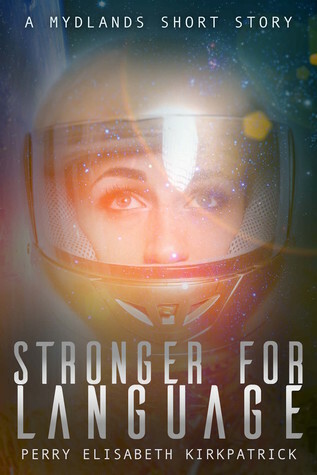 Stronger for Language is part of Mydlands, a Creative Commons sci-fi universe. This is a short story (approx. 16 minutes average reading time). To ask other readers questions about Stronger for Language, please sign up. Okay, this was adorable! Kenzie is such a fun narrator, and Rion and Rigel are the cutest things ever. The interaction between Kenzie and the boys and between Kenzie and her husband were spot on, and the dialogue was so realistic. While short, and therefore not leaving a ton of room for description, there was never a time I was confused. The sci-fi technology was very cool, especially the Neutrabubble. Overall, a fun short, light read! I Okay, this was adorable! Kenzie is such a fun narrator, and Rion and Rigel are the cutest things ever. The interaction between Kenzie and the boys and between Kenzie and her husband were spot on, and the dialogue was so realistic. While short, and therefore not leaving a ton of room for description, there was never a time I was confused. The sci-fi technology was very cool, especially the Neutrabubble. Cute story! Aliens (within certain limits) are usually the one area where I'll let my sci-fi blur the line with fantasy, and if they existed, I can see this being a very believable linguistic pickle! I loved the fact that Kenzie's unique contribution to the diplomatic mission came from the skills she had developed as an unranked, unofficial member of the mission--a stay-at-home mom. (Is it still called that when your home is a spaceship?) Society at large tends to degrade homemakers these days, a Cute story! Aliens (within certain limits) are usually the one area where I'll let my sci-fi blur the line with fantasy, and if they existed, I can see this being a very believable linguistic pickle! I loved the fact that Kenzie's unique contribution to the diplomatic mission came from the skills she had developed as an unranked, unofficial member of the mission--a stay-at-home mom. (Is it still called that when your home is a spaceship?) Society at large tends to degrade homemakers these days, and it's nice to have them celebrated for once--not in spite of their role but actually because of it. I also loved that the alien civilization recognized and respected her for her role as a mother. Really fun, short read. Being a babysitter, I can totally relate to interpreting kids speech! The main character was very sweet. Overall, fun quick read. Perfect for Sci-Fi lovers. Well, that was cute ... and interesting! I don't read a lot of sci-fi, but since I won a giveaway for this book, I read it! I absolutely loved the twins!! <3 So sweet! It's so true about the way little one's talk though!! Anyway, I liked it. Since I have an actual copy of it, I'd read it again, but it wasn't my favourite. I really like the tiny paperback copy of won though! SO ado Well, that was cute ... and interesting! I don't read a lot of sci-fi, but since I won a giveaway for this book, I read it! A cute, interesting story set in space. Never thought someone would write this kind of a story set in sci-fi, but it worked and was super fun! There’s plenty of Star Wars and Star Trek type stories and hero types in science fiction – but the idea of a gentle fiction in space? What a stupendous idea and one I’ve always been interested in. Seeing a mother living out an average day aboard a star-ship was definitely an intriguing scenario. The world building was good – I really liked the alien culture (particularly the attention to speech pattern—something that is often overlooked in world building) and the descriptions of the 2 1/2 stars. The world building was good – I really liked the alien culture (particularly the attention to speech pattern—something that is often overlooked in world building) and the descriptions of the tech aspects. I felt that a bit of the characterization / dialogue seemed a wee bit stilted – but it was still cute. I got a good chuckle at the “shut up” fiasco with the twins. I’m looking forward to reading more science fiction stories from Perry Elizabeth Kirkpatrick. Such a cute and creative short story! I loved the Voald! Now that was hilarious and refreshing! I enjoyed reading this scifi short story because of the very casual, normal approach. I also love how this isn't your typical "professional" and "serious" type of scifi. Perry's approach here is out-of-the-box as far as space scifi is concerned. A toddler-language translator, crazy little twins, "Mother-of-the-Future" reverence, and an alien with humour on a not-so-typical First Contact encounter. In the mornings when I'm not going to bed anytime soon. This is a new take on language translations. I love how Perry brought in toddler speak and combined it with alien language skills. She did a great job developing the characters in this short story. This was a perfect short story for a quick read. I received a free copy with no compunction for a review, good or bad. Since this is a short story, I'll keep my review brief. Nothing was wrong with this story. It was clean and well thought out. Sci-fi isn't my favorite, so that's why I have it three stars. If you like sci-fi, you'd probably like this. little story with a cute theme. Perry Elisabeth Kirkpatrick lives in an undisclosed location outside of Phoenix where she and her husband chase their four little boys and an escape-artist dog. They don't chase their cats, however, because cats hate that. She is the author of "The Kitten Files" mysteries, "The Accidental Cases of Emily Abbott" spy series, and multiple short stories. In addition to her writing, Perry enjoys graphi Perry Elisabeth Kirkpatrick lives in an undisclosed location outside of Phoenix where she and her husband chase their four little boys and an escape-artist dog. They don't chase their cats, however, because cats hate that. She is the author of "The Kitten Files" mysteries, "The Accidental Cases of Emily Abbott" spy series, and multiple short stories. In addition to her writing, Perry enjoys graphic design, playing a number of musical instruments, and watching movies that make her laugh. Find her books, newsletter, and free stories at www.perrykirkpatrick.com.